Last offseason, I spent a great deal of time (specifically in this article) trying to explain why volume-based metrics are more important for wide receivers in fantasy than efficiency metrics. In general, volume-based metrics are much more predictive (in terms of predicting fantasy points in the following season) and stable than any efficiency metrics. However, there was one metric that far exceeded my expectations – yards per route run. Across the PFF-era (2007-2017), there have been 565 instances of a wide receiver drawing at least 50 targets in back-to-back seasons. Using this as our sample, yards per route run had a 0.43 correlation to receiving fantasy points scored in the following season. Raw targets fared only slightly better (0.46) and yards per target fared much worse (0.18). Yards per route run is one of my favorite metrics, and it’s why you might have noticed I’ll frequently reference it when attempting to identify breakout candidates at the wide receiver position. It’s also why you’ll rarely see me reference yards per target, or why I’m apt to chastise fantasy analysts who put too much stock into it. If you’re a PFF Elite subscriber you can access our yards per route run data for wide receivers (here), running backs (here), and tight ends (here). With this in mind, let’s look at the top-10 wide receivers (min. 50 targets) by yards per route run last season. Perhaps again speaking to YPRR’s value as a metric, you’ll notice the top-10 list is littered with some of the consistently best wide receiver in the league (and there were relatively few surprises). Jones has consistently been the league’s most efficient wide receiver on a per-route basis, ranking first, first, first, fifth, and first in yards per route run over the past five seasons. Jones also led all wide receivers in targets per route run last season (30.5 percent), but he’s at a detriment for fantasy for ranking low in total routes run per game, as we outlined here. Brown ranked second-best in yards per route run last season and has ranked top-seven in each of the past five seasons. His ranking last year becomes all the more impressive when we consider Brown had — easily — the toughest cornerback schedule of any wide receiver. Brown spent 53.0 percent of his routes lined up against top-30-graded cornerbacks (highest) and drew 41.4 percent of his targets against top-30-graded cornerbacks (highest). Despite being less efficient than Jones in this category, he typically ranks much better in volume and production, and should be drafted as the first wide receiver off the board in any league. After a somewhat pedestrian start to the season, Allen exploded over the final seven weeks, averaging 23.9 fantasy points per game over this stretch. Over this span, he outscored the next-closest wide receiver by 27 fantasy points and the second-closest wide receiver by 42 fantasy points. 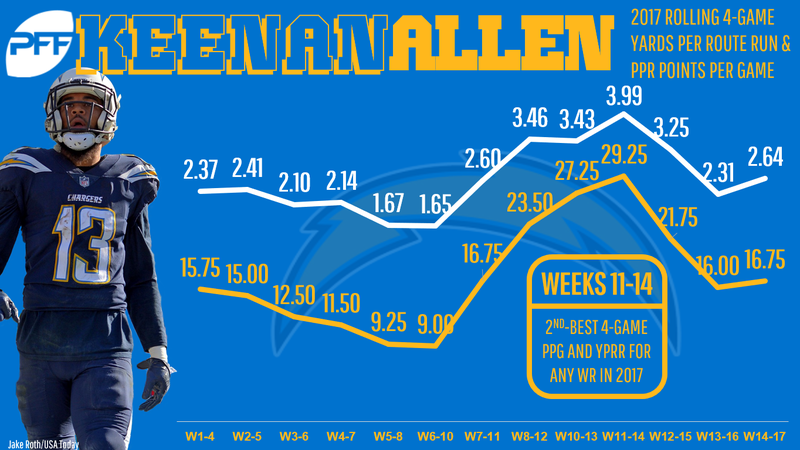 Allen might just continue this historic pace next year, after the team lost Hunter Henry for the year (62 targets last season) and Los Angeles went 5-0 in the five games Allen totaled more than 11 targets. Hill has now ranked top-six in yards per route run in each of his two seasons. Over this span he ranks 14th among wide receivers in fantasy points but just 33rd in targets. For this reason, many are highlighting Hill as a top regression candidate heading into the 2018 season. However, when considering just how efficient he’s been throughout his short career (also ranking top-15 in WR rating in each of the past two seasons), I think it’s likely he might just be one of the better wide receivers in the league and will continue to overachieve (for fantasy) on a smaller workload (like DeSean Jackson and Doug Baldwin have done throughout their careers). Still, I suspect he’s a tad overvalued at ADP (WR13), as I argued here. Thielen’s breakout in 2017 may have been a surprise to some, but it wasn’t to me. In 2017 he was what he was in 2016 – hyper-efficient. In 2016, Thielen was one of only two wide receivers (along with Michael Thomas) to rank top-20 in yards per route run, yards per target, WR rating, and drop rate. For the second year in a row, he’s also trumped Stefon Diggs in yards per route run, which might support the ADP differential between them (WR11 vs. WR16). While I can take credit for predicting Thielen’s breakout, I can’t say the same for Woods, who I had ranked well below Sammy Watkins last year. After years of fantasy irrelevance in Buffalo, Woods took a massive step forward in Los Angeles. Woods graded out as our No. 15 wide receiver last year, after ranking 55th of 97-qualifying in the previous season. He also ranked 17th in fantasy points per game (13.8) last year, which is well above his current ADP (WR37). Smith-Schuster’s 2017 season wasn’t only efficient, but it was also historically efficient. As I wrote here, his 2.16 yards per route run average ranks fifth-best among all rookie wide receivers (min. 75 targets) in the PFF era. In terms of WR rating, his 2017 season ranks first among all rookies over this span (134.0). His ADP (WR18) feels high, but he finished 11th among wide receivers in fantasy points per game last year (14.8) and rookie wide receivers tend to make a significant improvement in year two. Here are the wide receivers (min. 50 targets) who ranked bottom-10 in yards per route run last season. Not only did Jones rank last in yards per route run in 2017 (0.69) but this was also the third-lowest number ever recorded in the PFF-era. He also ranked bottom-10 in WR rating and his catch rate of 36.5 percent is also the 13th-worst by any wide receiver with at least 50 targets since targets became a stat (1992). I had high hopes for Jones coming out of college, but after these underwhelming numbers and a tumultuous offseason, it’s hard to get excited about Jones’ prospects for fantasy, despite not having much competition for targets in Buffalo. Beasley ranked second-worst in yards per route run last season but ranked 11th-best in 2016. Target volume was partly to blame, going from 4.4 to 6.5 routes per target, but general efficiency was also a concern. Beasley ranked third-best in WR rating in 2016 (122.5), but 49th in 2017 (86.4). Still, with Dez Bryant, Jason Witten, and Brice Butler leaving behind 229 targets in their absence, I’m expecting a bounceback fantasy season from Beasley, even if his per-target efficiency doesn’t improve. Nelson ranked fifth-worst in yards per route run last year, after ranking top-30 in each of the prior six seasons. His numbers were slightly deflated due to an injury to Aaron Rodgers (Nelson averaged 1.43 yards per route run in games he was active), but I think this speaks to Nelson’s risk heading into the 2018 season. At age 33, there’s a possibility he’s finally hit a wall. Over the past three seasons Roberts has ranked sixth-, third-, and 11th-worst in yards per route run. Over this span, he’s run 85 percent of his routes from the slot. Meanwhile, over the past two seasons, Nelson and Amari Cooper have been among the league’s most efficient wide receivers when running routes from the slot. I suspect Oakland will be much better off if they move Nelson or Cooper into the slot full-time and leave Roberts on the bench. Keep an eye on offseason beat reports to determine which wide receiver to upgrade if that’s the case.